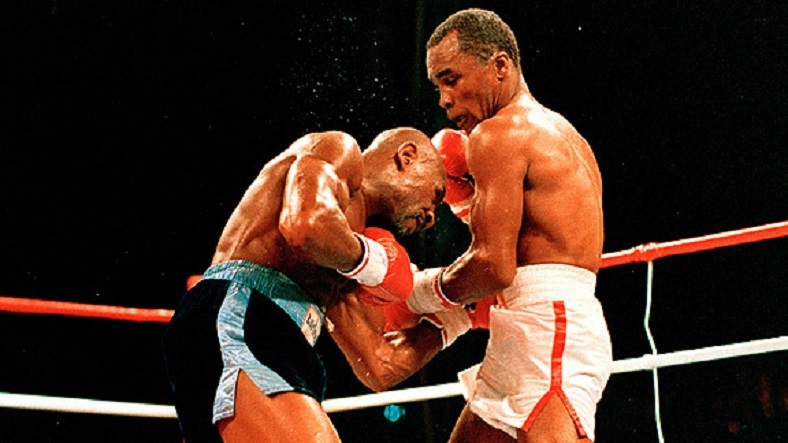 Back in 1987, Sugar Ray Leonard and Marvelous Marvin Hagler threw down in a highly-advertised middleweight championship fight in Las Vegas, a glorious spectacle which captured the attention of the entire sports world. The controversial result, which saw the challenger and massive underdog upset the champion by a 12-round split decision, is still hotly debated to this very day. The fight changed the course of both boxers’ careers, as Hagler, feeling he’d been robbed and sick of never getting the respect he deserved, hung up his gloves for good. Leonard, who had first retired back in 1982, would ironically go on to more big fights and win world titles in both the super middleweight and light heavyweight divisions. But what if I told you that the colossal superfight of 1987 between these two boxing superstars could have, and should have, taken place at a much earlier date? As incredible as the event was, let’s be honest: the actual fight in terms of drama, intensity, action and its respective ring performances failed to truly equal it. 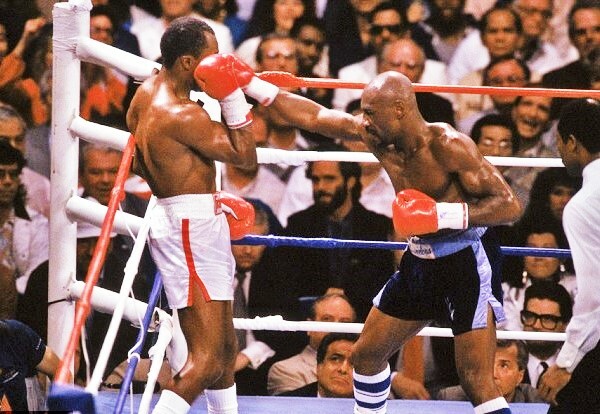 The reason for that is simple: while both Leonard and Hagler were still formidable, neither was anywhere close to being at their best going into that legacy-defining clash. In fact, in 1987 there were far more questions regarding these two fighters than there were superlatives. 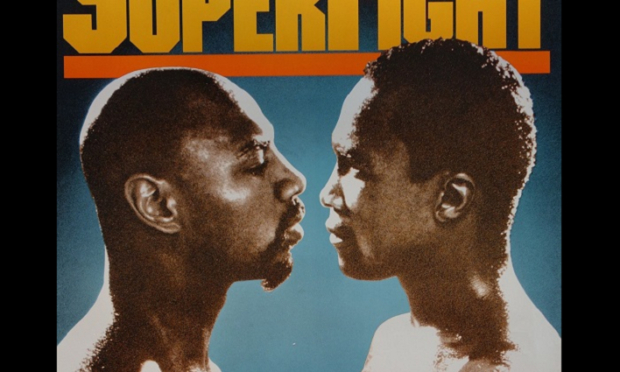 While Hagler was just 32 and hadn’t lost a fight in eleven years, some wondered if his skills were eroding, a fact seemingly borne out by his grueling battle with John Mugabi in 1986. 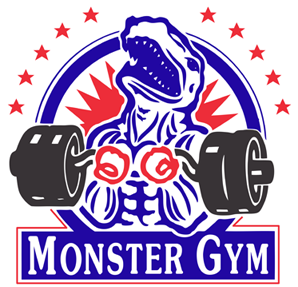 All the grinding years of training and the many wars had taken their toll. Meanwhile Leonard had fought only once in five years and his inactivity caused many to be concerned for his welfare as he stepped up to take on the biggest and baddest challenge of his career. But rewind five years and the situation was very different. At that point in time you would have been hard-pressed to find people who didn’t regard Leonard and Hager as the number one and two fighters, pound-for-pound, in all of boxing. Against Mugabi in ’86, Marvin suddenly looked less-than-marvelous. Even before the Massachusetts native got his paws on the middleweight belt, there was a strong consensus that Hagler was the best fighter in the division, the uncrowned king. 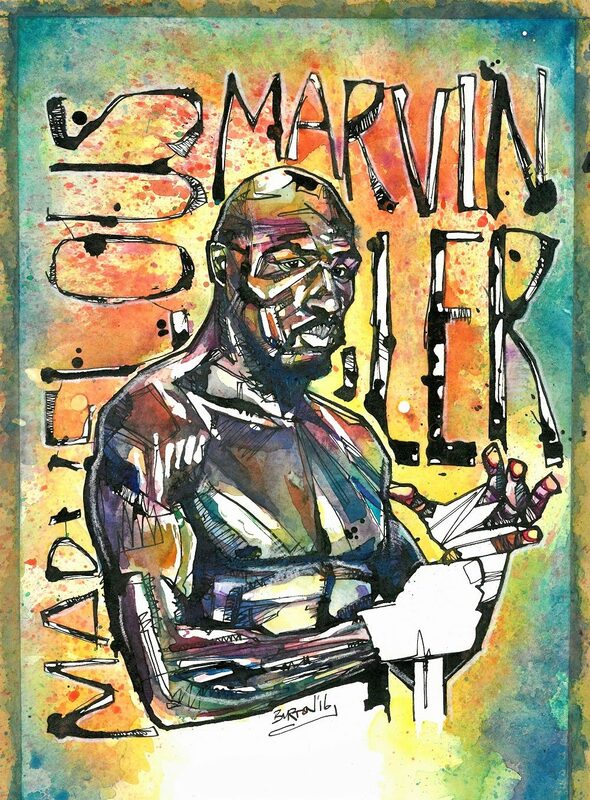 After being blatantly robbed in his first world title opportunity against Vito Antuofermo in 1979, Hagler finally captured the middleweight championship in 1980 from current champion, Alan Minter, in an authoritative display. From there on, Hagler used his menacing and bruising style to batter the opposition into submission and few wanted any part of the undisputed middleweight king in the early ’80s. As the boogeyman of the 160-pound division, Hagler needed a worthy challenger who would elevate his name and produce the big payday he so justly warranted. 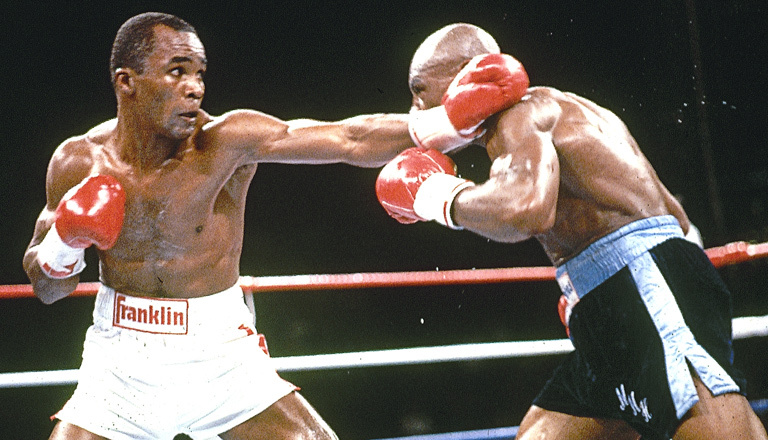 The obvious choice was the man who was the biggest attraction in the game, Sugar Ray Leonard. In 1982 Hagler was nothing less than dominant. Regarded as the superstar heir to Muhammad Ali, Ray was a media favorite and a ratings hit on national television. He was marketable, had a chivalrous smile that lit up a room, and fast fists that put butts in the seats. 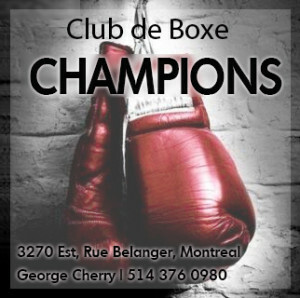 He had already defeated the likes of Roberto Duran, Thomas Hearns and Wilfred Benitez in exciting, high profile bouts. As the undisputed welterweight champion, Leonard’s star power was on par with athletes in other sports like Magic Johnson, Larry Bird, Wayne Gretzky and John McEnroe. In the early 80’s, the biggest name in the game, by far, was Sugar Ray Leonard. Drawing by Damien Burton. 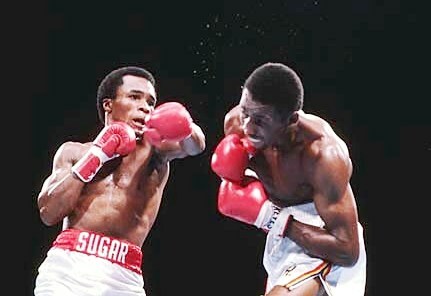 Sugar was the king of the ring after defeating Hearns in ’81. 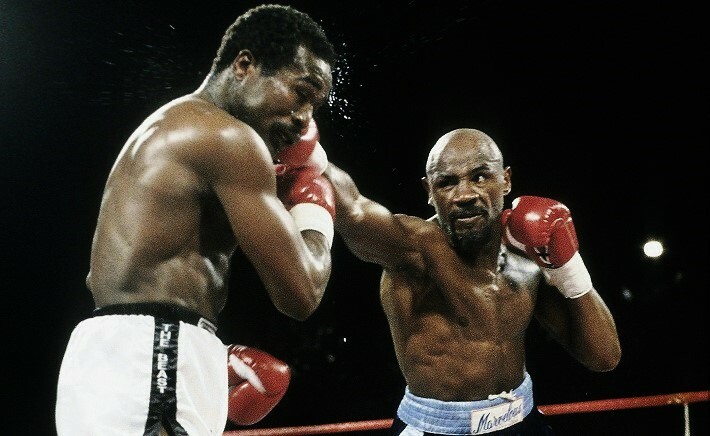 Hagler was pissed off that he was being led on and left still seeking that major fight that would exhibit how great he was, while Leonard retired because of his detached retina. What a shame. Let’s imagine for a moment Leonard made the opposite pronouncement in Baltimore, that instead he declared, “Fortunately, it’s going to happen!” and Hagler vs Leonard was immediately set for early in ’83. Marvin was 28-years-old; Ray was 26. As huge an attraction as Sugar Ray vs Marvelous was in 1987, a battle in 1983 would have topped any level of hype. More to the point, it would have resulted in a much better fight. Just imagine what might have unfolded in a clash between Leonard and Hagler when both were at their peak. I get giddy just thinking about it. Could Ray have held off the 1983 version of Hagler? 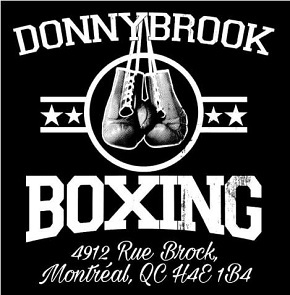 You have in one corner the orthodox Ray with his lightning-quick jabs, nimble movement, underrated power, awesome combination punching, not to mention his killer instinct and willingness to go to the trenches if necessary. In addition, Ray was a consummate performer, a boxer who loved to put a show on for the fans. And in the opposite corner is the bigger man with an array of deadly weapons: Hagler, the southpaw and switch hitter, with power in either hand, a deadly jab, heavy body attack, a granite chin and incredible conditioning. How would a battle between Sugar Ray and Marvelous Marvin have unfolded in 1983? We’ll never know, but here’s my take. As good as ’87 was, ’83 would have been on another level. First of all, this fifteen round match is for the undisputed middleweight championship, with no catchweights and all of Hagler’s belts on the line. I envision Ray utilizing the same basic approach we saw in ’87, but the huge difference being that in ’83 he is at his apex. 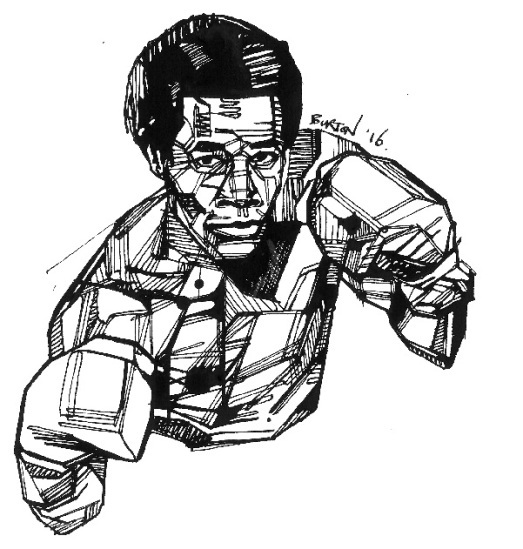 I see Leonard using plenty of movement and some fancy footwork to throw Hagler off and avoid the bigger man’s power, similar to how he boxed Roberto Duran in the famous “No Mas” rematch. If Marvin had a weakness, it was adapting to foes with speed and agility, who used the ring and kept their distance from his power. Given Leonard’s skill and astonishing speed, I see Ray sticking and moving and giving Hagler some major problems. Our author envisions a more assertive Hagler. But that said, I also think peak Hagler would be far more assertive and sure of himself than was the case in ’87 when he fought the first four rounds tentatively and from the orthodox stance. I see Marvin setting a faster pace and pressing Leonard, taking some quick counters in the process but also catching Ray with timely hooks and heavy straight lefts. I don’t see any knockdowns, nor either man’s stamina waning, especially in the late rounds, though I can see Hagler’s body punching and inside fighting sapping some energy out of the lighter Leonard. 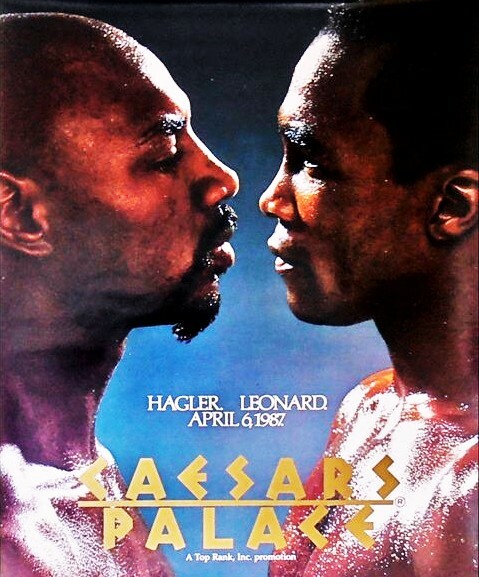 As the bout progresses, Hagler has increasing success in cornering Leonard and forcing exchanges on the inside and it’s in those moments when Marvin’s advantages in size and strength are telling. Whenever you have a matchup between a great, natural middleweight in their prime going up against a great, natural welterweight in their prime, with both being virtually equal skill-wise, the advantage generally swings in the direction of the bigger man. With both fighting at their highest level, and with the momentum shifting throughout, I’m picking Hagler to do just enough to prevail over Leonard in a fifteen round classic. Simpson is picking this guy in ’83. Painting by Damien Burton. And if you think the 1987 fight was something, I have no doubt the 1983 battle would have wiped the floor with it. In my humble opinion, a 1983 superfight between Sugar Ray Leonard and Marvin Hagler is the greatest “What If” match-up in boxing history, topping all the other amazing clashes that fight freaks wish they could somehow go back in time and make happen, such as Jack Dempsey vs Harry Wills in 1925; Jake LaMotta vs Rocky Graziano in 1950; Roberto Duran vs Alexis Arguello in 1978; Sugar Ray Leonard vs Aaron Pryor in 1982; Mike Tyson vs Evander Holyfield in 1991; Lennox Lewis vs Riddick Bowe in 1993, and Floyd Mayweather vs Manny Pacquiao in 2010. 15 rounds?? You’re being optimistic and letting the Sugar spoil your koolaid. Hagler would’ve put his two gloved hands on sugar Ray and tore him apart like a teddy-bear!! Are you insane?? SRL was one of the most over-hyped champs in history. Recently the modern, lighter version of Hagler, Spence came out and said Mayweather would beat Leonard. And Duran beat peak Leonard. He was very good, fast strong and intelligent. 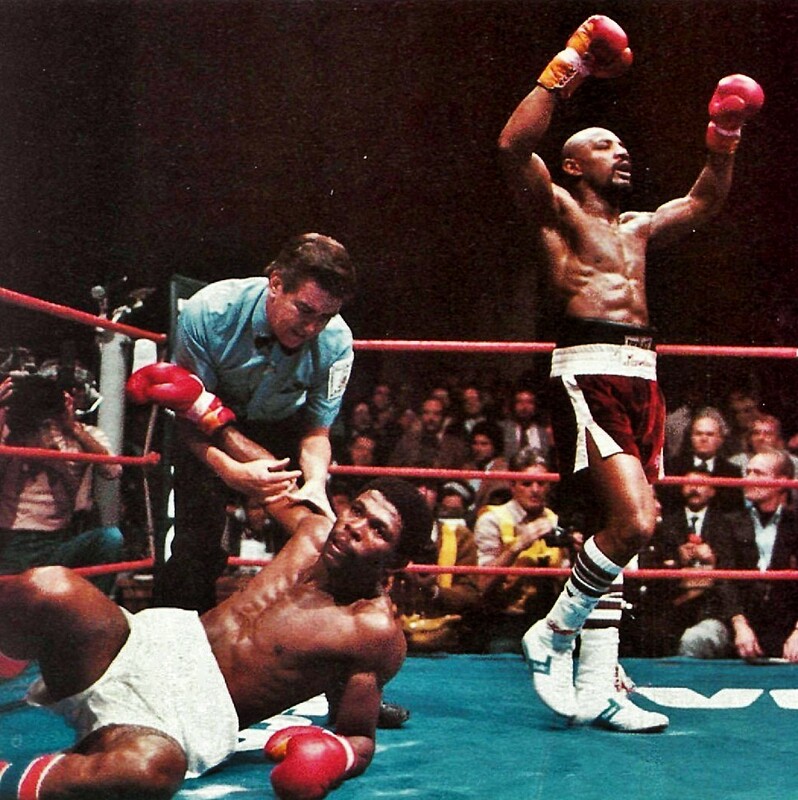 But Hagler was less of a fighter and more of a category 4 hurricane until he broke over the shores of Mugabi. And remember, BEFORE the Mugabi fight Hagler lost his legs. He couldn’t even run in the ring anymore. He walked everywhere. No more leaping and bounding just walking. Disgusting conman posing as a champ. I must correct one thing; Hagler is actually a New Jersey native. He moved to Mass. as a youngster.